UPDATE: Who said "Barack Obama is a talented man -- and by the way he's an American, he's a Christian." Read the Washington Post, Jeb Bush responds to Trump: Obama is an 'American, he’s a Christian'. "If Jeb Bush is going to run for president as something other than a Bush, it will take a transformation worthy of Rachel Dolezal. And yet the former Florida governor, who once accidentally checked 'Hispanic' on a voter registration form, is doing everything but change his appearance to de-emphasize his inheritance. His presidential campaign logo, introduced over the weekend, is a simple exclamation: 'Jeb!' His brother, the 43rd president, and his father, the 41st president, were not in attendance for his presidential announcement speech in Miami on Monday. He didn’t even mention them until nearly the end." Read the Washington Post, Jeb Bush runs away from his family name. Read also the Washington Post, Jeb’s logo can’t hide the troublesome family name, which notes that that "[t]he logo is Jeb! but voters do know his last name." UPDATE VI: "Remember how much Republicans wanted to repeal Obamacare? The Republican majority in the House of Representatives has voted more than 50 times to repeal the law. Conservatives have twice brought challenges to the Supreme Court — a court with powerful voices that often lean in their direction — only to be largely rebuffed both times. The last government shutdown was driven by Republicans who insisted on defunding Obamacare . . . When it comes to meeting one of its most important goals — providing coverage to the uninsured — it is working extremely well." Read the Washington Post, The success of the Affordable Care Act is a hugely inconvenient truth for its opponents, which notes that "the success of the ACA strikes at the heart of the dysfunction strategy employed extremely effectively by anti-government conservatives. This is the self-fulfilling-prophecy strategy that campaigns on: 'Washington is broken!' . . .
Never mind that those making that case are the ones doing the breaking." UPDATE V: So much for that Republi-con "Obamacare would destroy the economy" myth. "In a 2011 press conference, John Boehner used the phrase "job killing" once every two minutes. 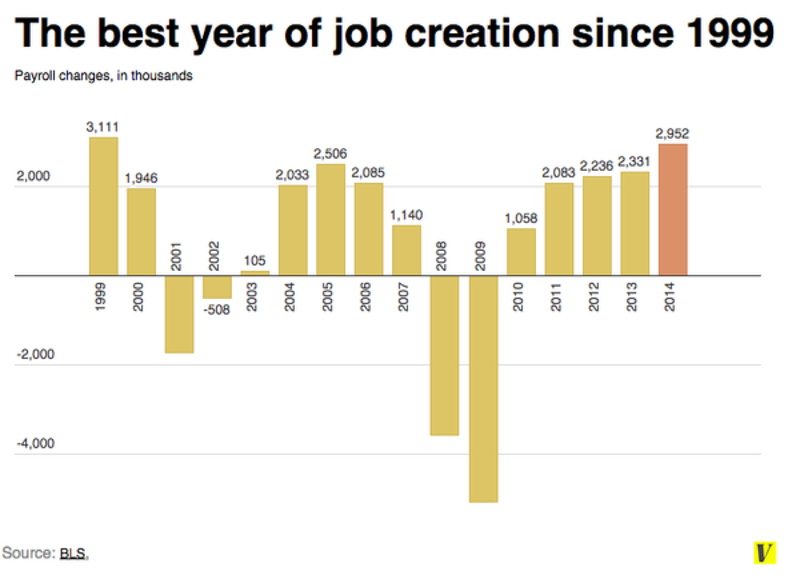 Then in 2012 we had the best year of job creation since 2005. In 2013 we had an even better year of job creation. Then in 2014, we had an even better year, the best since 1999." Read Vox, A chart that Obamacare's fiercest critics will have a hard time explaining. Gallup describes its findings this way: 'The Affordable Care Act has accomplished one of its goals: increasing the percentage of Americans who have health insurance coverage.'" Read the Washington Post, As GOP continues denouncing Obamacare as failure, uninsured rate falls yet again. 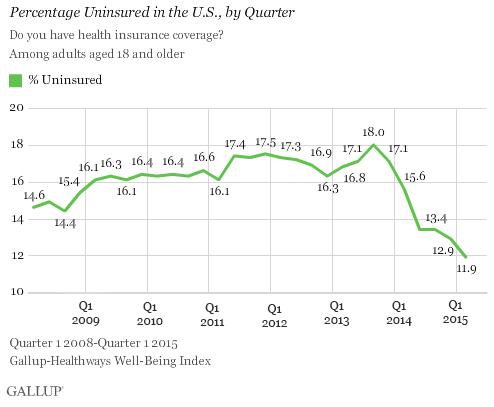 UPDATE III: It's the 2014 election, curious why you haven't heard more about Obamacare, because it is working. Read Topix, Stunning Admission From This Republican Governor: Obamacare Helps People. UPDATE II: "One of the many, many, many predictions of Obamacare failure made by conservatives is that insurance companies would systematically drop out of the exchanges. They made this prediction many, many, many, many, many times. The data is starting to come in and, guess what, insurance companies are joining the exchanges. Dan Diamond reports that, in every state that has reported information so far, the number of insurance companies competing in the exchanges will expand in year two." Read New York Magazine, Today’s Obamacare Non-Train-Wreck News. "Dean Angstadt fells trees for a living. He's a self-employed, self-sufficient logger who has cleared his own path for most of his 57 years, never expecting help from anyone. And even though he'd been uninsured since 2009, he especially wanted nothing to do with the Affordable Care Act. 'I don't read what the Democrats have to say about it because I think they're full of it,' he told his friend Bob Leinhauser, who suggested he sign up. That refrain changed this year when a faulty aortic valve almost felled Angstadt. Suddenly, he was facing a choice: Buy a health plan, through a law he despised, that would pay the lion's share of the cost of the life-saving surgery - or die. He chose the former. 'A lot of people I talk to are so misinformed about the ACA,' Angstadt said. 'I was, before Bob went through all this for me. I would recommend it to anybody and, in fact, have encouraged friends, including the one guy who hauls my logs.' . .
Read The Philadelphia Inquirer, Once opposed to ACA, now a convert. Angstadt now realizes it was Republi-con lies repreated on Hedgehog News that almost got him killed. "All the disasters conservatives have predicted to date have failed to materialize. The website did not have to be rebuilt from scratch. The exchanges did not have to push back their start date. The administrative fix did not render the law unworkable. There has been no actuarial death spiral. Democrats have not called for repeal. All the disasters have simply been pushed further into the future. . .
[N]one of the things conservatives warned about happening have actually transpired. The evidence to date is completely consistent with the hypothesis of success. Costs and premiums have come in under projections, young people have signed up, insurers plan to expand their participation, and actuaries project stable premiums." Read New York Magazine, Obama Declares Obamacare Victory.